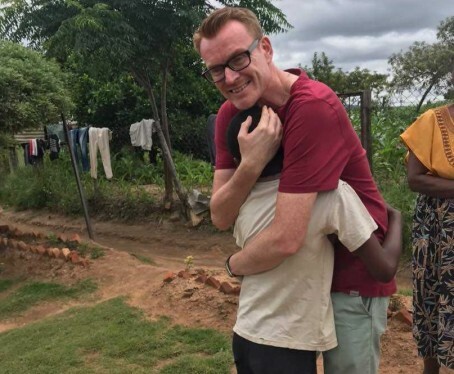 A former regional journalist travelled to Zimbabwe to meet the child whose education he has sponsored for the past two years. Wayne Coles, who worked at the Hull Daily Mail and Milton Keynes Citizen, went to the African nation to see 10-year-old Morgan, for whom he has provided £18 a month to pay for his tuition. In Zimbabwe, children whose families are unable to afford tuition fees are unable to attend school. Wayne and his wife Alice travelled to meet Morgan and his family during a recent visit to the country. Now a communications manager at the Centre for Agriculture and Bioscience International, Wayne plans to run the Reading half-marathon next month in aid of Creating Better Futures, the charity which supports Morgan’s schooling. He said: “All too soon our visit to Morgan and his family was over. We left with some groceries for grandmother – bread, milk, sugar – the basics but relative luxuries where the staple food is maize meal, probably some greens and rarely meat. “My donation through CBF provides one meal at school, teaching and a uniform but I left feeling I could do more not only for him but the other children. To sponsor Wayne, click here.